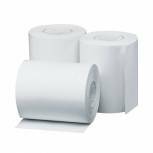 White Thermal Till Roll 57x38x12mm (Pack of 20) THM573812 Pack of 20 Thermal paper for use in tills. Easy to use, precise printing. Rolls work smoothly in printer. Economical choice. Dimensions: 57x38x12mm. Pack of 20 rolls. Colour: White. 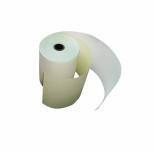 Prestige Thermal Credit Card Rolls 57mmx38mmx12mm RE00026 Pack of 20 High quality thermal rolls for chip and pin PDQ card reader. 57mm x 38mm x 12m. Fully approved by OEM. Pack 20. White Thermal Roll 57x30x12mm (Pack of 20) THM5730mm Pack of 20 Thermal paper for use in credit card machines. Easy to use, precise printing. Rolls work smoothly in printer. Economical choice. Dimensions: 57x30x12mm. Pack of 20 rolls. Colour: White. 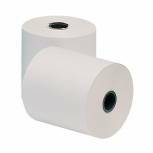 Prestige Thermal Till Rolls 80mmx80mm White RE10606 Pack of 20 A range of thermal rolls for office printers. All rolls give a well defined Black image. 80mmx80mx12.7mm. Pack 20. 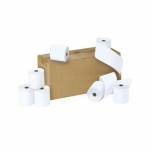 Prestige Thermal Credit Card Rolls 57mmx30mm RE00032 Pack of 20 Rolltech credit card rolls. 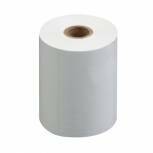 White thermal paper. Size: 57mmx30m x 12mm. High quality paper rolls for credit card readers, fully approved by the OEM. Pack of 20. Q-Connect Calculator Roll 57x57mm (Pack of 20) KF50200 Pack of 20 Q-Connect Adding Machine Rolls, manufactured from single ply, wood free. A quality bright White paper producing a crisp clear image. End of roll warning ensures that you never run out of paper. Size: 57x57x12.7mm. Prestige Till Rolls 1-Ply 76mmx76mm White RE04055 Pack of 20 A comprehensive range of rolls manufactured to the highest tolerances ensuring trouble free operation on all leading models of cash register machines. Top quality paper provides excellent print quality. Packed 20s. 76x76mm. 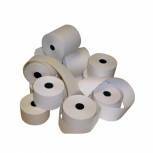 Prestige Thermal Till Rolls 57mmx55mmx12.7mm RE10468 Pack of 20 Rolltech Credit Card Machine Roll TH352. 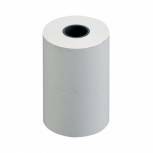 White thermal paper. Size: 57mm x 55m x12.7mm. High quality paper rolls for credit card readers, fully approved by the OEM. Pack of 20. 3-Ply Till Paper Roll 76x76mm (Pack of 20) AD3767612 Pack of 1 Paper roll for tills and cash machines. 3-ply construction for durability. Size: 76x76mm. Pack of 20 rolls. Prestige Thermal Credit Card Rolls White 57mmx46mm (Pack of 20) THM572512 Pack of 20 Rolltech credit card rolls. 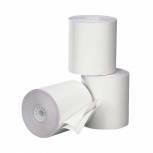 White thermal paper. 57mm x46m x 12mm. High quality paper rolls for credit card readers, fully approved by the OEM. Pack of 20. 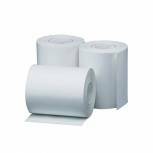 White Thermal Till Roll 80x80mm (Pack of 20) TH243 Pack of 20 Thermal paper for use in tills. Easy to use, precise printing. Rolls work smoothly in printer. Economical choice. Dimensions: 80x80mm. Pack of 20 rolls. Colour: White. 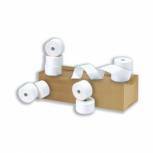 Prestige Thermal Till Rolls 57mmx 80mmx12.7mm RE10491 Pack of 20 Replacement thermal roll for cash registers. High quality white paper. Efficiency boosting. Warning strip alerts you when running low. Dimensions: 57x80x12.7mm. Pack of 20 rolls. Colour: White. Premier Rolls For Digital Tachograph 57mmx9.5m (Pack of 3) TACOROLL Pack of 3 Digital Tachograph Rolls. Fully EEC approved rolls (E1/E2/E3/E5) for use with all digital tachograph machines. Size - 57mm x 9m. 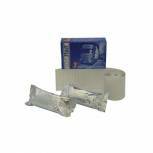 Prestige Credit Card Rolls 2-Ply 57mmx55mmx12.7mm White RE07028 Pack of 20 High quality carbonless paper rolls fully approved by OEM to fit the most popular credit card systems on the market. 57x16.6x12.7mm 2-ply White/Yellow. Prestige Till Rolls 1-Ply 44mmx70mm White RE04023 Pack of 20 A comprehensive range of rolls manufactured to the highest tolerances ensuring trouble free operation on all leading models of cash register machines. Top quality paper provides excellent print quality. Packed 20s. 44mmW x 70mm Dia, with a 17mm core.